Unions provide significantly more opportunity to African Americans in the construction industry than nonunion contractors. The Economic Policy Institute has found that African Americans made up 23.3% of all employed workers in New York City between 2002 and 2011. 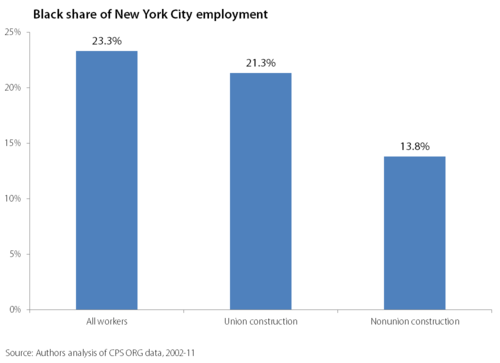 While in the nonunion construction sector, African Americans only make up 13.8% of workers. Underrepresentation of African Americans in the union construction sector have a far less gap in relation to the overall benchmark—21.3% versus 23.3%. The Economic Policy Institute also provided underrepresentation data in two educational categories. For African Americans with some high school or some college education, the union sector still overwhelmingly represented more African Americans than the nonunion sector. Labor unions give workers more opportunities than the nonunion groups by using methods such as family-supporting Project Labor Agreements and prevailing wages, methods that the Associated Builders and Contractors (ABC) strongly oppose. How can the ABC be the “voice” of the construction industry, when African Americans in the nonunion construction sector are so underrepresented? Read more at The Economic Policy Institute Blog.